Madtongsan in the Elizabeth Arcade serves a long list of under-$10 numbers like Korean kim chi pancakes. Friendly staff, simple décor – that’s lunch covered. In the Valley, one of the most popular Chinatown Mall restaurants is not Chinese. It’s the Thai Wi-Rat, which is also sort of Laotian. Late-night party-goers love this unprepossessing spot, where every soup on the menu is under $10. Another Valley late-night set hideout is Harajuku Gyoza (Brunswick Street). Scrumptious Gyoza dumplings and a fun atmosphere are yours for just $8. In the once arid culinary zone of Milton, workers can now feast at Mrs Luu’s (25 Railway Terrace) on the things Vietnamese do best, like rice paper rolls and baguettes. The gorgeous iced coffees are pitch-perfect on a sticky Brisbane summer’s day. One smart way to fly under the $10 radar is with all-day breakfast. Au Cirque café at New Farm does it with a French twist of truffle oil on your sourdough and feta for $10.50 (OK, so just above the radar). 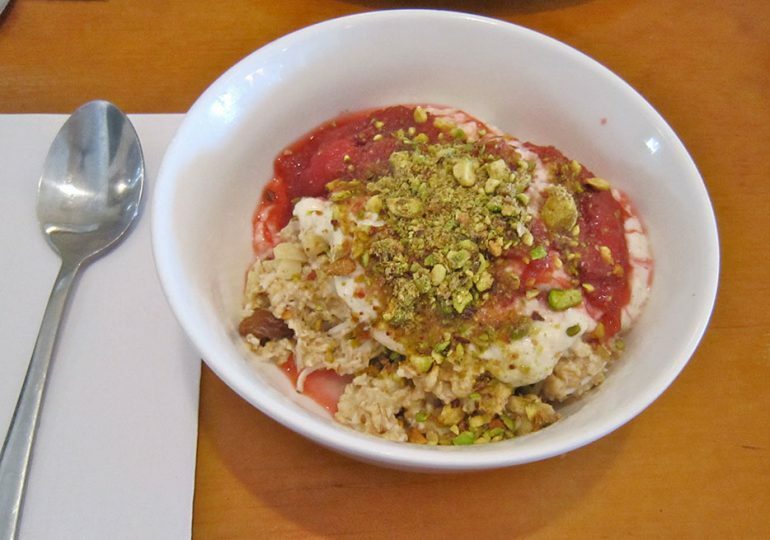 At Sisco (500 Boundary St, Spring Hill), you can fill up on a lush Bircher muesli replete with poached pear and berry compote for $7.50. That means change towards coffee. Some of the best-kept secret eats are in the ‘burbs. Hosokawa (53 Racecourse Rd, Hamilton) does a $10 tofu salad with sesame dressing that is truly seductive. Not far away at Dandelion & Driftwood (45 Gerler Road, Hendra), a hot-pressed sandwich basket is the go for a daring $11, like the chunky smoked chicken breast on malt loaf. Lady Marmalade (cnr Logan Road and Cleveland Rd, Stone’s Corner in the Gabba’s burgeoning foodie hub) does okra and bean gumbo on toast with crumbly feta and dukkah for $9.90. In the cultural pot-au-feu that is West End, bargain-hunters are spoilt for choice. Queue up for beef soup at Quan Thanh (75 Hardgrave Road), or settle for a $10 meat platter at King Ahiram Lebanese (88 Vulture Street). Cheap food is great, but it’s even better when it comes to you. Harold Fleming’s Bun Mobile was Brisbane’s first food truck and is still one of the best. Classic buns filled with Wagyu beef, Hoisin pork or teriyaki chicken are just $8. The Wandering Elephant brings tasty Asian street fare to you in your office, at the park or building site. Everything is under $10. Talk about food with legs. Brisbane is bursting with opportunities to spoil your palate and pamper your purse. Tuck in!